Hidden away, in the jungle valleys of Princeville on Kauai's North Shore, dramatic topography, natural landscaping and tender cultivation have born a sacred garden wonderland, called Princeville Botanical Garden. Truly a paradise within paradise, Princeville Botanical Garden is an isolated oasis on an island that is, itself, an oasis. It is a private gardener’s utopia, a magical space that immediately enraptures your senses and transports your mind and body. The Princeville Botanical Garden that we know today - a beautifully manicured home site with sweeping views of the Hanalei Mountains and Pacific Ocean, sitting atop approximately 8.75 acres of broad trails carved into terraced hillsides, expansive gardens, tapered jungle valleys, flowing streams and thousands of plants, of more than 700 varieties - is an astounding residential property and a botanist's dream, but it did not always exist in this idyllic state. 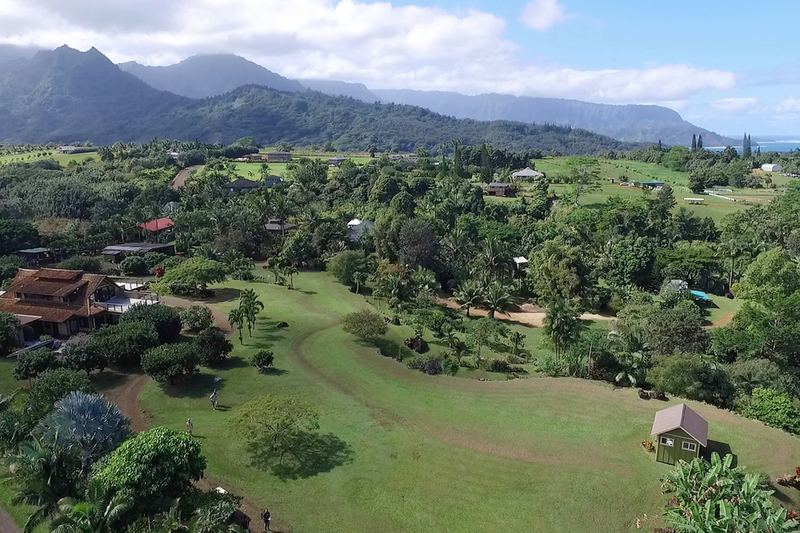 Previously cattle land, centuries of unrestricted plant growth had strangled out the native flora throughout this part of the Anini Stream Valley, up until 2001, when the current property owners, Bill and Lucinda Robertson, purchased the property and began a 15-year passion project to bring the Garden we know today into existence. Michelangelo once wrote of his art, "In every block of marble I see a statue as plain as though it stood before me... I have only to hew away the rough walls that imprison the lovely apparition to reveal it to the other eyes as mine see it.” Similarly, with the Garden, something brilliant and beautiful seemed to have very naturally emerged from its element, as if it was always there, and the stewards of this land, Bill and Lucinda, simply released it. For Bill Robertson, the gardens were akin to a puzzle that needed to be put together. The goal was to remove the invasive jungle, determine the shape of the land beneath, then prepare that land for its most natural use. Bill’s touch was distinct, and the most dramatic: the massive earth and rock works found everywhere. You’re first introduced to them while walking toward the valleys from the home at the top of the property – the dramatic boulder terraces were originally a huge, 30-40 foot grass hillside dubbed “the bowl” or “the wave.” The property’s river-valley topography is steep and tricky, however, it's the perfect playground for earthmoving machines, and the central terraces are but one of many major earthworks projects. Bill ensured every valley side was accessible by a long series of walking trails and steps that were meticulously carved out with chainsaws, stump grinders, and hand tools. The trails are shored up with Trex, rebar, wood, and stone. Solid, well-placed rock walls were constructed to hold up roads or hillsides. Compacted gravel paths were laid for small ATVs, and where necessary, judicious amounts of concrete were used to protect against erosion. Irrigation systems were installed through the majority of the property, though many areas were hand watered by hose for years. Lucinda Robertson was almost always at Bill’s side when planning and executing the hardscaping. A born artist who has worked in many mediums, Lucy oversaw composition, tree and rock placement, and general “feng shui." You can see Lucy’s influence in the larger, negative spaces, such as Lucy’s Park, shaded with rudraksha trees at the end of the Sacred Valley, or the fact that the terraces are not covered in large, permanent trees that would obscure the vista. Lucy's most evident personal touch on the Garden are the hundreds of orchids hidden throughout the landscape, nesting in both tree and rock formations. Thanks to Lucy's contributions, the gardens are not oppressive with over planting, nor are they predictable. They feel organic, intuitive and inviting. Bridge over the stream at the valley floor. Bill and Lucinda worked diligently to create the perfect infrastructure for a garden - like a canvas for an artist - but it would not be the botanical garden it is today, showcasing hundreds of species of indigenous and introduced, medicinal, majestic, floral and fruit-bearing plants, without the help of their good friend and lead gardener, Michael. Michael had carried on a lifelong love affair with botany. Over the years, he had developed an eclectic taste for tropical and subtropical plants from around the world. These gardens provided the perfect opportunity for him to overindulge his passion, as Bill and Lucinda were infected by his knowledge and excitement for plant diversity. Under Michael's guidance, Bill and Lucinda targeted and ordered seeds and plant starts from around the world. The garden now holds nearly seven hundred different species and cultivars, exceptionally diverse in nature but naturally accommodated by the varying landscapes and environments of the property. Michael personally placed the majority of the plants in the earth with generous helpings of organic fertilizers, organic compost and other natural amendments to enrich the dense, acidic Hawaiian soil. Under Michael's care, an astounding percentage of his plantings have taken hold and thrived, and professional botanists from around the world, including staff and researchers from the National Tropical Botanical Gardens, have marveled at the scale and health of this plant collection. Thanks to Michael's expert touch, the plants and land seem to have grown effortlessly and naturally into existence with each other. Thousands of plants have now found a home in the Gardens, and the land realized its true purpose. Walking through the gardens is a delight for the senses. The design of the land and layout of the plants are captivating and please the eye, while the air is rich with scents you can almost taste – sweet fruit and blossoms blend with rich earth and wet moss. Even more wonders of nature are abound to please the ears, as birds play during the day and at night, the toads and owls keep watch with gentle calls, and the soft buzzing resonates from the onsite beehives. As you meander the winding pathways, a new scene and experience emerges around every corner, and the shear size of the property and breadth of the natural wonders allows for a truly unique experience with every pass through. For Bill and Lucinda, one of their greatest pleasures evolved to be the sharing of these experiences in the Garden with others, so in 2010 they opened the property to the public, offering small, 3-hour guided tours. In the time since, they have entertained thousands of visitors and spent countless hours sharing the sights and sounds of these beautiful grounds, explaining the nature and history of the plants, offering samples of homemade chocolate made from their high-yielding cacao trees, as well as sharing tastes of honey tangerines, mangosteens, lychee, rambutan, or whatever other fruit happens to be in season. As of this writing, more than 300 tour visitors have shared exceptional reviews of their experience on TripAdvisor (see HERE), making Princeville Botanical Garden the #1 rated "Thing to Do" in Princeville, and one of the top 20 "Things to Do" on the entire island of Kauai (out of 235)!